SURPRISE, Ariz. (AP) The Kansas City Royals have finalized a $2.5 million, one-year deal with Martin Maldonado, giving them a veteran catcher after losing Salvador Perez to a season-ending injury. The deal announced Monday includes up to $1.4 million in performance bonuses for games caught. 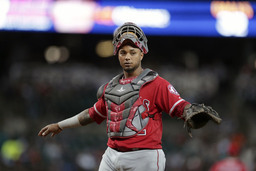 Maldonado spent last season with the Los Angeles Angels and Houston Astros, hitting .225 with nine homers and 44 RBIs in 119 games. But his biggest strength has been his ability to frame pitches and play defense, and his experience should help what is expected to be a young Royals team this season. Maldonado's Gold Glove in 2017 broke Perez's streak of four straight. Perez underwent Tommy John surgery last Wednesday after tearing a ligament in his throwing arm during a spring training workout.